OSWEGO, NY Ã¢â‚¬â€œ Oswego City School District officials continue to explore the possibility of changing the schedule at the high school. Recently, team leaders were instructed to share the (proposed) schedule with their departments and collectively present a list of pros and cons. A proposal was presented at the Feb. 2 board meeting. “There was much debate and controversy over the possibility of altering the high school schedule,” said Patty Oughterson, OHS principal. On Feb. 17, the committee re-convened to synthesize all the information from each department, Oughterson said. 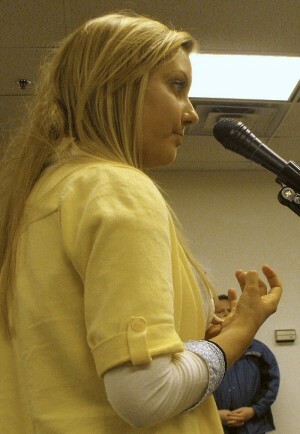 OHS student Kimberlyn Bailey gestures as she makes a point at this week's school board meeting. “Since that time, we were asked to present another ‘sample’ schedule that would meet our goals to reduce the number of study halls, increase instructional minutes and decrease the length of lunch times for students,” she said. The team, including teachers, parents and some students researched local school district bell schedules. It looked for a common length of day and for similarities in the socio-economic population. They came up with a schedule that was developed using the format of a neighboring district. “Our greatest concern in any change to the schedule is that we accomplish our goals with affecting the integrity of our special programs,” the principal said. The (proposed) nine-period schedule presented March 2 represents eight instructional periods and a lunch period. “Our hope would be to block certain periods to accommodate our remedial programs as well as continue to offer a rich curriculum for all students,” she said. The (proposed) schedule has been shared with the OHS faculty, Oughterson said. But, they haven’t had the opportunity to discuss that schedule’s impact on programs. Some of the cons associated with the first proposed schedule change were scheduling conflicts and difficulty, impacts on students’ course selection, possible loss of electives and loss of study hall time to do homework for students who work or play sports after school. The pros include less discipline problems during lunch, less wandering in the halls, and more instructional time. “It could work, It’s just tight scheduling, there’s very little wiggle room,” the principal explained. They wouldn’t loose all the study halls, she added. Lunch would interrupt one class. That was a pro and a con, depending on how you look at it, Oughterson pointed out. The students would like a chance to bring some more options to the board’s attention, she added. The revised proposal in essence is a nine-period schedule with eight class periods and a lunch, the principal said. It alternates lunches. However, it doesn’t cut down on study halls. According to Tom Drumm, president of the junior class, the majority of the class was opposed to going down to eight periods. The students are open to compromise, he pointed out. Many of the students were interested in a flex schedule or block schedule, he added. Under the latest proposal, students wouldn’t have enough time for lunches, Drumm said. “Lunch provides a break in the day, a little social time. If you keep kids in class for 50 some odd minutes and then you give them a shorter lunch, they’re going to be real bottled up in class and there will be more chance for disruptions,” he said. Kimberlyn Bailey an OHS honors senior who is interested in going into fashion. She feels the change could be detrimental to students because it would take away opportunities. “The thing is, if you don’t have a medium to display your work, your colleges, your scholarships do not care how good you are on your blog Ã¢â‚¬Â¦ do not care about how good you are at informal things. You need a way to display it,” she said. So, if students don’t have a period to get those classes to display their skills, they might not be able to get into the colleges and universities that they want, she said. In this economy, students really need scholarships to help them pay for higher education, Bailey said. That’s why they need a place to get their works recognized, she said. The board likely won’t take any action on this issue until after the budget situation has been resolved, according to Sam Tripp, board of education president. They need to take action now because it can affect the budget by allowing the district to lay off multiple teachers. If the teachers are forced to spend more time working, others can be laid off, saving us a lot of money. Any schedule change from the current one will have a major impact on students. That should be the focus of any schedule discussion, not the impact on teachers. We want our students to have the opportunity to take Honors level classes, AP classes, electives, and for enrichment classes to be held in math and literacy. Any change from the current nine periods will impact the choices students have. The focus here should not be on forcing teachers to spend more time working, but on how changing the schedule impacts students. I think the school district needs to think long and hard about the WHY change the schedule? More time in class rooms doing the same thing the same way will NOT provide a better education. Reducing student opportunities for creative growth through arts, music and other “electives” as well as much needed down time to recharge during the day will NOT improve student performance. I agree we need to be creative in order to improve our district and children’s performance but doing the same thing the same way only longer will NOT cause that to happen. We need to allow more creativity to get our students ready for 21st century challenges that will be demanded of them. Not all rote and “by the book” as in the past 50 years of education. Let’s teach smarter not just longer.